300rwhp from NA stroked M52 doesn't add up but perhaps I am missing something. Yes it does considering the mileage. Same thing with the other DS. any predictions on of if it will.actually sell? Could it be an outlier or could it be a sign of softening M3 prices? That DS '88 car was a really good deal. Wonder why it went for what it did. Market softening for non concourse cars? less desirable color? would be my guess. Not everyone likes black/DS. 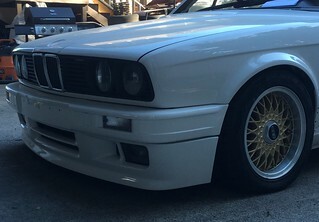 my e30 is closing in a day! There's lots of high priced parts and work that went into making it what it is. I am thinking $8900 which to me is super low but I think that posted comment about the rust might be turning off buyers. Last edited by Javier h; 08-01-2018 at 07:57 AM. $3800 with 2 hours to go? Wow, it's gonna have to make a hell of a comeback with a bidding war between 2 or more people who really want it. Could it be because it's in Canada?